It was back to the gym tonight with Gareth, I've missed a whole week of exercise so it was slow going tonight, plus the stitch didn't help. Tonight I only did 2 and a half mins of running, 30 mins on treadmill, 10 mins on cross trainer. Then I went onto the bikes and rowing machine. Lastly we finished up with some weight and ten mins of hilarity of Gareth trying to sit ups with the weight ball. He succeeded in the end but the trying was amusing. I feel better now I've been to the gym, feel like I have actually done something to help with my weight loss and can't wait to get back there on Friday evening. 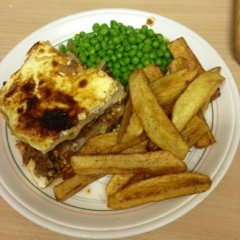 Before I went out I had cooked home made lasagne. Just 1 and a half syns per serving. I put mine with chips and peas. 1. Place a large, non-stick frying pan over a high heat. Add the mince, onion, mushroom, and garlic and stir-fry for 6-8 mins. Add the tomatoes, passata and dried herbs, season well and cook for 12-15 mins, stirring often. 2. Meanwhile mix together the yoghurt, eggs and nutmeg until smooth. Season well. 3. Preheat oven to 200c/Gas 6. Spray a medium-sized lasagne dish with Fry Light. Spoon half the mince mixture into the base and top with half the lasagne sheets. Spread over half of the yoghurt mixture and top with the remaining mince mixture. Top with the remaining lasagne sheets, spread over the remaining yoghurt mix and sprinkle over the Parmesan. 4. Bake in the oven for 25-30 mins or until the top is golden. Remove from the oven and serve immediately. You can also build up the superfree by adding courgettes or peppers, or to give it a kick some chili's. Now the lasagne is beautiful but the yoghurt topping didn't really go with my taste palette, so I have been looking at alternatives. Tesco white lasagne sauce is 11 syns for 200g, this divided by 4 servings is 3 syns, so all in all a serving with jar of white sauce on top will be 4.5 syns. This I am still happy with and I believe it will taste creamier. Also I have to point out that with this recipe I added 500g of mince to bulk up the meat, and I could actually serve 6, so the lasagne was actually 1 syn each serving.